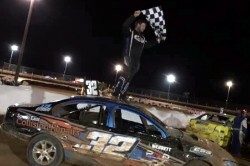 Gartner and Nigel Reichstein would start on the front row after nine qualifying heats, on a highly competitive night of racing which saw nine different winners in the heats, Gartner and Reichstein record a win, a second and third placing to win the front row. Rhys Heinrich and Sam Brumfield would start on the second row, with Jayden Edwards and Carey Weston starting from positions five and six. Gartner would get the best of the start, leading Reichstein and Heinrich through the opening laps. Reichstein hounded Gartner in the early exchanges, taking the lead on lap five, with Brumfield and Edwards fourth and fifth. Rhys Heinrich would be the only major withdrawal in the front half of the field, meeting his demise on lap twelve, elevating Brumfield to third. Gartner was in a great battle with Reichstein for the lead, as both searched for their first title win. Reichstein led for the majority of the race, with Gartner making the decisive move, just three laps from the finish, to regain the lead. Gartner was able to hold on to narrowly defeat Reichstein, with Brumfield a third of a lap behind in third place, just ahead of Edwards and Victorian Corey Sandow. Gartner had previously finished second in the SA State Title in 2016, while for Reichstein it was his first podium. Sam Brumfield who finished third had previously been the runner-up in 2003. Ben Whitehead who earlier won the B Main, did a great job to finish eighth in the title behind Jason Duell. Heat 6, 10 Laps: 1. S32 Steven Gartner, 2. NT15 Sam Brumfield, 3. S58 Neville Nitschke, 4. W40 Andrew Norton, 5. T110 Terry Hammond, 6. S71 Andrew Maxwell. DNF: 7. S68 Paul Hayes (3 laps). Time: No Time, Winning Margin: 0.606, Fastest Lap: 18.782 NT15 Sam Brumfield.